Again, the prayers of the faithful remind me that when nothing else makes sense, walking with God in faith frees and heals. I will remember James Foley, not for how he died, but for the memory of his life and his witness in a very dark place. May his parents, family and friends find comfort knowing he is in the arms of a loving God. Those left behind who shared space, indeed were shackled, with him tell stories to us of a man of God, a man who encouraged them even as he was singled out for the most harsh treatment. I never had the chance to meet James Foley, and now I never will. There is another man of God whom I know only through the stories told by others. I will never meet him either, although I hope to walk in the city where he walked and is buried in November. I don’t know if my faith will ever be tested this way. I pray that it never is. But if it ever is, I want to be found encouraging those with me. I want to be found sharing what I have with those who have less. I want to be raising my voice so others will hear and respond. I want to be a witness to my God, father and creator, savior and redeemer, counselor and guide. I want to be found faithful, faithful as James Foley and Fr. Frans van der Lugt. There are other models of faith to me in those places, still serving like Fr. Frans: Assis Mikhael in Sidon; Preacher Rula in Tripoli; Assis Ramsey in Zahle; Assis Hadi in Minyara; Joseph, Adeeb, George and Fadi, all pastors in Beirut; Najla and Mary, preachers in Beirut; Assis Boutros in Damascus; Assis Maan in Mahardeh; Assis Saoud in Hesekeh; Assis Firas in Kamischli; Assis Mofid in Homs; Assis Haitham, Assis Magdy, Elder Zuhair, Assis Farouk, Assis Magid, His Grace Patriarch Louis Sako, Saidna Habib, Msgr. Emad, Father Aram, Father Turkum, all in Iraq. These are the ones I know and have worshiped with. These are the models I pray for regularly. They are my friends, my brothers and sisters, my heroes of faith. 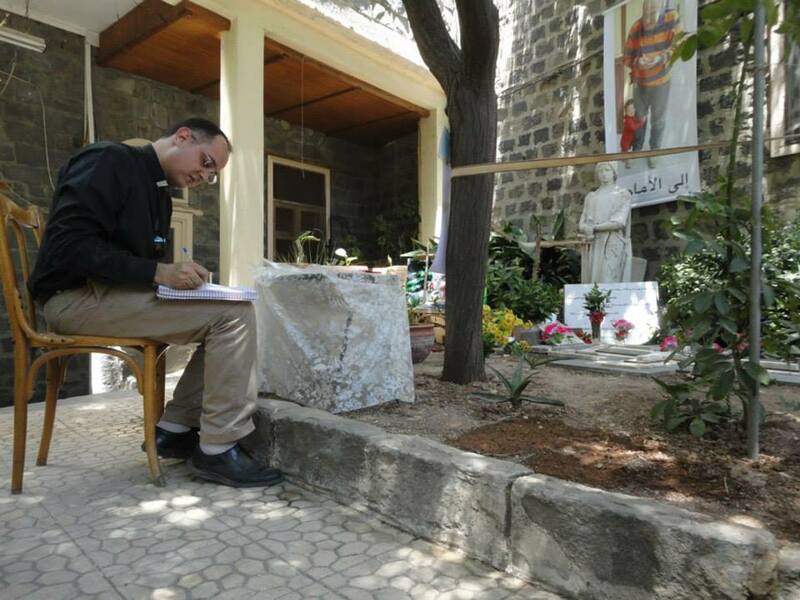 My friend Assis Salam Hanna at the grave of Fr. Frans van der Lugt in Homs, Syria, May, 2014. Several weeks after Fr. Frans was murdered, the two-year siege of Homs was lifted. My friend Assis (Rev.) 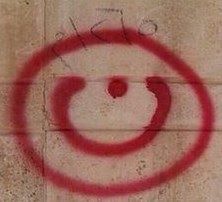 Salam Hanna posted this picture at his grave. He also posted a video of the church bell being rung at the Evangelical (Presbyterian) Church of Homs, where his father Samuel had served as pastor for decades. Salam and Samuel were fellow ministers with Fr. Frans in Homs. The Evangelical Presbyterian Church of Homs, Syria, May, 2014. 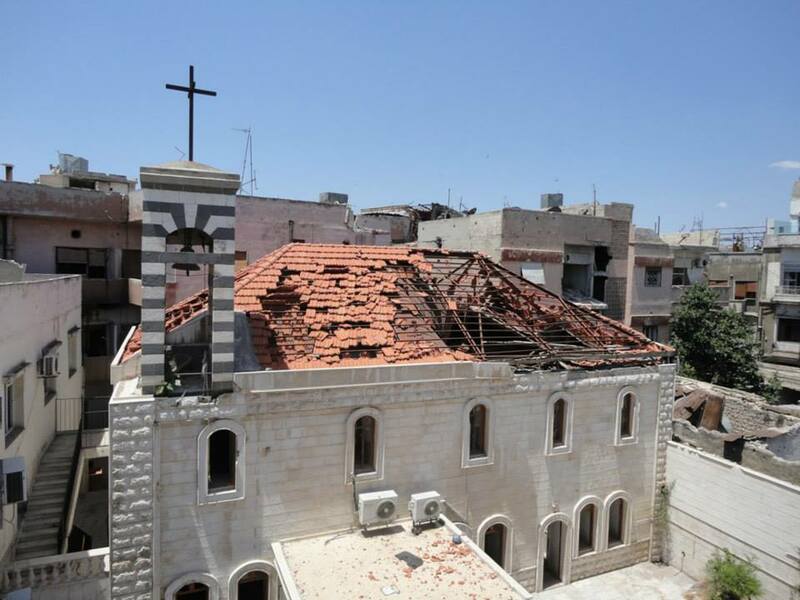 That church building, like many others in Homs, suffered damage during the siege, but the church body had returned to start repairing it even before their own homes. With God’s blessing Steve and I will walk in that place in November when we return to Syria with a team of fellow sojourners.